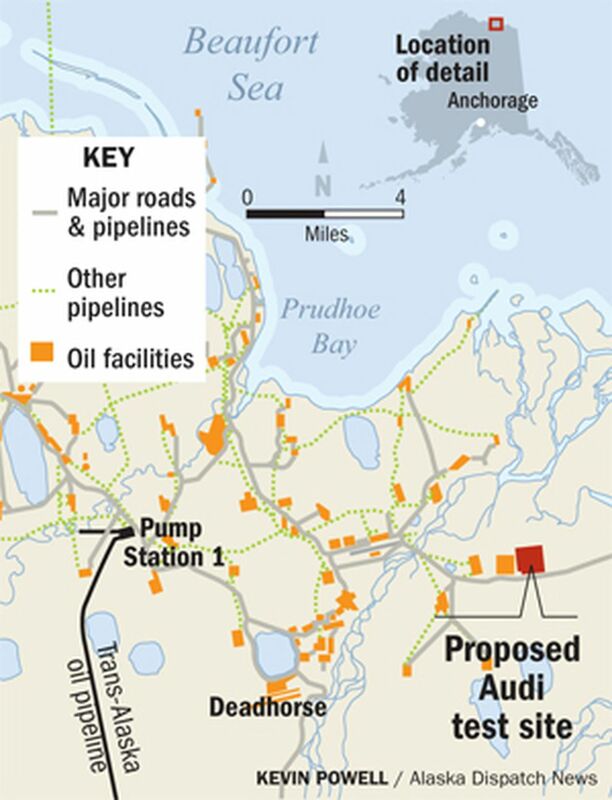 Audi is eyeing an unusual, extreme place for its latest test track: Alaska's North Slope. Starting in 2016, the German luxury carmaker hopes to build an ice track on Arctic tundra wetlands where it can conduct research and development testing during the North Slope's long winter, says a land use application posted in a public notice online. Audi, a subsidiary of Volkswagen, wouldn't comment on the plans to build the track, with spokesman Brad Stertz writing only that "we often do cold-weather durability testing in Alaska." Details of the ice track are outlined, though, in the company's land use application to the Alaska Department of Natural Resources. One square mile of land has been requested for use off Endicott Road northeast of Deadhorse, across the Sag River and next to an old gravel pit in an area controlled by BP. The remote location is about a 500-mile drive north of Fairbanks, where Audi says it already employs over 80 employees during the winter. "They want this to be as private and not-viewed by the public as possible," said natural resource specialist Sean Willison, who is reviewing the application for DNR. The testing grounds are closed to the general public, "due to safety concerns and privacy concerns associated with the testing of prototype vehicles," the application says. "Cold-weather research and development testing ... is proprietary and sensitive internal material and technology," the application continues. The company plans to test a maximum of 10 vehicles per day for about five months each winter. The company expects to test traction control systems, anti-lock braking systems, all-wheel drive systems and acceleration and braking at the proposed track. While the lease is for 1 square mile, cars will only be tested on a 2.74-acre circular track within that space. The goal is to rotate the track's location on the property from year to year, "just to be a little more friendly to the tundra," Willison said. Ice roads generally take longer to melt during the spring than surrounding snow, which in turn shortens the underlying tundra's growing season. Moving the ice roads every winter lessens the impact to the landscape, Willison said. Vehicle testing in Alaska's unforgiving weather is not a new occurrence. An Alaska Journal of Commerce article from 2001 noted that companies flock to Fairbanks to test cars during the winter. A decade later, an article from Bloomberg Business noted the same phenomenon in northern Sweden. Ice roads are likewise common on the North Slope, used by oil companies to crisscross the frozen tundra without leaving a permanent mark on the landscape. Last winter, nearly 400 miles of ice roads were approved by the state, according to a January 2014 Alaska Dispatch News article. Last year, Audi conducted similar tests driving on an oil field support company's ice road, Willison said. Once the state realized the company wanted to continue testing every year, "we kind of put the brakes on things" and had them apply for a land-use permit, Willison said. Initially Audi wanted to build a track down the Dalton Highway on a small, shallow pond, Willison said, and construct a snow berm to block any viewing from the highway. They ran into a corridor restriction, however, and ended up working with BP to find a space that worked on the oil fields, Willison said. Audi will hire a construction firm to create and maintain the ice track. To minimize chances of oil leakage, vehicles will be equipped with gear underneath the vehicles to catch any spills. If approved, the permit will be good for 5 years, after which the company can reapply. The company would pay a monthly lease to the state as part of the permit. After public comment closes, the department will review the request, Willison said.